6 IMPORTANT POINTS OF INTERNATIONAL LAW REGARDING THE NEW YORK AGREEMENT OF 15 AUGUST 1962. The West Papuan people never agreed to be part of Indonesia. We have always rejected the integration imposed on us by Indonesia and the international community via the New York Agreement (1962), and within two years had established the Organisation of Papua Freedom (OPM) to voice our ambition for independence. Although the OPM is usually regarded by foreigners as a guerilla organisation, the OPM has a political department, a diplomatic department, and a clandestine organisation. In 1989, it adopted non-violence, and our campaign for self-determination since then has often been described as inspirational. I know, that in the near future, it will deliver our dream of self-determination and independence. Since the beginning of the Indonesian occupation in 1963, thousands of West Papuans have been kidnapped, tortured, raped, imprisoned, and killed by the military. Many more have disappeared. TAPOL, the Human Rights Organisation in London, reports that one hundred thousand West Papuans have been killed. The Protestant and Catholic Churches in West Papua, say, that four hundred thousand have disappeared. The military’s activities continue as I speak. 1. The New York Agreement, 15 August 1962: a treaty designed by John F Kennedy’s America to solve problems between the Dutch and the Indonesians. It replaced the Dutch in West Papua with the Indonesian military government. The West Papuan people were not consulted. 2. United Nation’s Resolution No. 1752, September 1962, by which the United Nations took responsibility for the New York Agreement – and is therefore responsible for the Indonesian occupation of West Papua, and partly responsible for everything that has happened since. 3. Three Presidential Instructions, issued by Sukarno on 1 May 1963, the first day of Indonesia’s occupation, closing West Papua to the international community, declaring West Papua an active military zone, and introducing subversion laws so there would be no opposition to Indonesian rule. 4. Indonesian government regulations of 1966. These rules were created for elections in Indonesia, which were not held until 1972, six years later. However they were used in West Papua in 1969 during the Act of Free Choice, enabling Indonesia to subvert the democratic process, and to choose 1,025 representatives to vote. 5. Act of Free Choice in 1969. The New York Agreement stipulated that a referendum be held no more than six years after the Indonesian occupation. Indonesia organized a nineteen-day ‘consultation’, a flawed process that was widely criticized. Nevertheless, the United Nations accepted the results of the referendum and delivered West Papua to the Indonesia Republic. 6. Indonesian Political Party Regulations of 1985. These re-inforced the government regulations of 1966. One ensured Golkar, Suharto’s party, would always be the dominant political party in Indonesia. Another declared that the referendum system was not acceptable in Indonesia – which made our attempts to hold a proper referendum in West Papua illegal. West Papuan resistance, and plans for the future as an independent Melanesian nation on the western rim of the Pacific, are now well organised. It is now up to the international community to decide whether it can afford to continue observing the rights of West Papuans being violated, and whether it wants to become involved in solving a problem peacefully that it was responsible for creating. In our modern era, most of us agree to respect human dignity, democracy, the environment, and the law. I think that all of us would agree, it is best to solve the deadlock between Indonesia and West Papua by a democratic, not a military, process. That is, by referendum, where each man and woman can vote for autonomy, or for independence. To help bring this about, West Papuans need to build more links with communities in other parts of the world so that the international community will press the Indonesian military government to respect our human dignity, and our human rights, democracy and the law. The United Nations (that is, the international community) which is partially responsible for our situation, has an important role to play. For Indonesia to start talking seriously to West Papua, a third party, a mediator is required, which the international community can provide, or become. For a lasting peace, West Papuans and Indonesians have to learn to understand and respect each other. Indonesian government officials have to learn that military brutality is not the solution. They also have to learn that their understanding of our shared history, is not the same as ours. For many years, West Papuan students have been forming links with grass roots organizations in Indonesia. Through these organizations, we are making sure that Indonesian people are hearing our voice of reason and peace. We have been making sure they learn to understand the process of democracy. Democracy underpins peace, which, in turn, generates stability and prosperity. A peaceful, democratic Indonesia is the best guarantee of a prosperous independent West Papua. However, there will never be peace, while Indonesia keeps using its military to solve problems. We Papuans must strive to avoid conflict; must continue to look for just and peaceful solutions. We have to keep reminding the Indonesian government that it has a very serious problem in West Papua – particularly while they continue to use guns, rather than talking meaningfully to us. The indigenous people of New Guinea are Melanesians.3 They have lived there for at least fifty thousand years. Before they were colonized by foreigners, they lived a simple traditional life. They didn’t destroy the flora and fauna, they didn’t rob each other, they didn’t destroy their cultures, and they maintained their dignity. The colonizers introduced crime to the Papua lifestyle. They cut the beautiful Bird of Paradise in two, and called the parts West and East Papua. The Germans, the British and Australia controlled the east, which became independent in 1975 and is now called Papua New Guinea. West Papua has a different history. It was trading with China in the seventh century. In 1512 it was said to be Portuguese. The Spanish raised their flag and settled on 20 June 1545. The British established military posts in 1793, but left two years later. The Dutch were the European colonial power between 1898 and 1962, except for a brief period between 1942 and 1945 when the Japanese took control. Since 1963, the Indonesian Republic has ruled my homeland. On 19 December 1961, the Indonesian military government, under its first president, Ir. Soekarno, announced its invasion of West Papua. Alexej Drugove, a Russian interpreter stationed in Jakarta in June 1962, said that Moscow helped Indonesia by supplying six nuclear submarines, thirty special TUPOLEV airplanes, six amphibious crafts, six supply ships. and three thousand Russian troops who carried Indonesian identity cards. The Russian support increased Cold War tensions. Article 1 of the New York Agreement bound the Dutch and the Indonesians to a United Nations resolution that was passed five weeks after the agreement was signed. This meant that the transfer of my country from the Dutch to the Indonesians was approved by the international community. West Papuans were not consulted during negotiations for the New York Agreement or for United Nations Resolution 1752, and the transfer of colonial power simply meant they were to be controlled by another foreigner. On 1 October 1962, the Dutch Government transfered West Papua to the United Nations. Eight months later, the United Nations transferred the administration to the Indonesian military government. On the first day of the Indonesian occupation, Sukarno issued three orders, called Presidential Instructions 1 May 1963 (INPRES). 1. West Papua was closed to the international community. 2. West Papua territory become an operational military zone (DOM). 3. The Indonesian military government introduced Subversion laws (No. 11/PNPS/1963). After West Papua was closed to the international community, at least 100,000 West Papuans were kidnapped, tortured, imprisoned, raped, and killed by the Indonesian military, which wanted to rid the community of independent thinkers, and instigate a fearful climate before the referendum in 1969.5 The subversion regulation ensured that any other dissenting voices could be legally silenced. Article XIV of the New York Agreement stipulated that Indonesia could create new laws and regulations during its administration period. In 1966, Major-General Suharto, who had led a coup to depose President Sukarno, legislated a series of regulations (PP/1966) for general elections in Indonesian. They provided for a Peoples’ Consultative Council (DPR) and Legislative Assembly (MPR), and a Peoples Consultative Council in each province (DPRD). They also provided for three political parties, the Development Friendship Party, the Indonesian Democracy Party (PDI) and GOLKAR (a party for all Indonesian technocrats and civil servants). They also instituted the representative system of voting whereby 578 of the 925 members of the DPR were automatic members of GOLKAR – meaning that the Friendship Party and the Democracy Party would never be in the majority, even as a coalition. The regulations were introduced in 1966 – even though there were no elections in Indonesia until 1972, six years later. They were, however, used in West Papua during the Act of Free Choice in 1969, enabling Indonesia to subvert the democratic process stipulated by the New York Agreement, and to choose 1,026 West Papuan representatives to ‘vote’ in 1969. Democracy was also undermined when Indonesia, claiming the terrain of West Papuan was inaccessible, took 19 days to complete the referendum—that is, what is usual done in one day took place between 14 July and 2 August in 1969. More regulations, PAKET 5, Indonesian political party regulations (UU.Parpol) were introduced in 1985, detailing and re-inforcing the regulations of 1966. For example, PAKET 1 and 2, about elections, was legislative proof that Indonesia was a democracy, with a Peoples’ Consultative Council, a Legislative Assembly, and Provincial Assemblies. In fact, the government pre-determined appointment to these bodies by its relationship with GOLKAR. PAKET 3 referred to political parties—the Development Friendship Party (PPP), the Indonesian Democracy Party (PDI), and GOLKAR, a party for technocrats and civil servants—re-inforcing the impression of a healthy democracy in Indonesia, when, in fact, the ratio in parliament ensured that GOLKAR would always be in the majority. PAKET 3 also enabled Indonesia to claim that any political parties created by West Papuans were subversive. PAKET 4 legislated that in Indonesia, the referendum system was not known, and therefore not valid. PAKET 4, in fact, provided legislative immunity from claims that the 1969 ‘referendum’ was fraudulent, and protected Indonesia from West Papuan attempts to hold another. PAKET 5 limited the creation of any social organizations – which, in West Papua, might develop into grass roots political organizations. Neither the regulations of 1966 or 1985 have been reformed by the current more democratic regime in Indonesia that is currently led by President Wahid. 1. The New York Agreement of 15 August 1962. 2. United Nations Resolution 1752 of 21 September 1962. 3. The Indonesian Presidential Instructions of 1 May 1963. 4. The Indonesian military government’s regulations of 1966. 5. The Act of Free Choice between 14 July and 2 August 1969. 6. Paket 5 – Political Party Regulations of 1985. West Papuans struggled hard to defend their right to self-determination. On 19 April 1964, they created Organisasi Papua Merdeka/Organisation of Papua Freedom, a body for West Papuan voices to project their aspirations to Indonesia and the international community. On 26 July 1965, led by Sargeant John Calvin Jambuane from Cassowary Battalion IV, the OPM started its physical resistance and attacked Indonesia’s district military headquarters at Kebar in Manokwari. Two days later, Fritz/Ferry Awom, Marthinus Wambrauw, Julius Benyamin Wanma and Marthinus Prawar attacked Indonesia’s Battalion at Arfai in Manokwari. The OPM then moved to Sorong, Merauke, Panai/Nabire, Jayawijaya, Yapen Waropen, and Fak Fak. On 14 July 1969, the first day of the Act of Free Choice referendum, there was a big demonstration in Manokwari, followed by others at Panai/Nabire on 19 July, Fak Fak on 23 July, and in Jayapura on 2 August. Jayapura in 1963, still exists. 2. The OPM maintains the comprehensive struggle for self-determination that it initiated on 19 April 1964. The OPM has a political wing, a diplomatic wing, a military wing, and a clandestine wing. In 1989 it adopted a policy of non-violence. 3. The West Papua Liberation Army (TPN) has maintained its impetus since 1965. 4. Proclamation of an independent West Papua in Manokwari in 1965 by Fritz/Ferry Awom, Barend Mandacan and Lodewij Mandacan. 6. Proclamation of an independent West Melanesia on 14 December 1988 in Jayapura by Thomas Wapay Wainggai, SH, Ph.D.
7. The OPM’s Non-Violence Action organized in West Papua and twenty-two other Indonesian provinces in December 1982 by A.S. Kaliele, Jacob Rumbiak, Simon Mosso, Eddison Waromi, S. Paiki; and effective in West Papua since 14 December 1989. 8. Movement of West Papuans to safety in Papua New Guinea and overseas in 1962, 1969, 1977, 1984, 1986, 2000, and 2001. 9. Team of One Hundred West Papuans meeting with Indonesian President B.J Habibie in Jakarta in 26 February 1999, and demanded independence. 10. West Papua National Congress in Jayapura, 29 May-4 June 2000; and West Papua Council (Presidium Dewan Papua) created in June 2000. 11. The re-organisation of the OPM at a National Conference in Vanimo, 22 0ct-26 Nov 2000. Election of Political, Diplomatic, Military, Clandestine, and Non-Violent Action leadership announced on 3 December 2000. 12. National dialogue about autonomy between Indonesia government and West Papua people, 28-29 March 2001. Papuans rejected autonomy and re-iterated demand for independence. 13. The continual rising of West Papua’a national flag. 14. National and international diplomacy. For thirty-eight years the Indonesian military government has damaged West Papua’s natural environment and robbed its natural resources. It tortures, kidnaps and imprisons people. Thousands of women have been raped, and estimates of four hundred thousand people killed or disappeared. Can this continue? Can we afford to let the rights of all these Melanesians continue to be violated by Indonesia’s neo-colonial regime? What can be done to solve the problem? 1. West Papua should become part of the Indonesia Republic because West Papua was part of the Majapahit Empire which existed between 1293 and 1520. 2. The Sultan of Tidore in North Moluccas had long-claimed the Raja Ampat archipelago in the Birdshead region of West Papua, so the same region should also be part of the Unitary Republic of Indonesia. 3. The colonies of the Dutch East Indies were automatically part of the Unitary of the Republic of Indonesia. 4. West Papua territory would be used by the Dutch to re-claim control over the Indonesian archipelago. Guinea and annex the territory. by America to solve dispute between the Dutch and the Indonesians over West Papua. military-government on 1 May 1963 without a referendum. but still not implemented at the time of writing). A. West Papua was not part of the Majapahit Empire. The Majapahit Empire under the King Hayam Wuruk existed between 1293 and 1520. Its centre was in East Java, and it included two thirds of Java Island, small parts of South Borneo and South Celebes, the Western Lesser Sundas, and the Eastern Lesser Sundas to Central Moluccas.9 The Majapahit empire did not include Madagascar in West Africa and the Pas archipelago off the coast of Chili, a claim in all Indonesian documents, including school curriculum texts. Nor is there any evidence that the King of Majapahit conquered territory in West Papua. Thus, if Indonesia claims its occupation of West Papua is legitimate because it was part of the Majapahit Empire, why didn’t Indonesia also claim territory between Madagascar Island and the Pas Archipelago—which Indonesia also claims was part of the Majapahit Empire? B. West Papua territory was not part of the Sultanate of Tidore. In 1660, the Sultan of Tidore publicly announced to the Dutch East Indies Company (VOC) that West Papua territory was under his control.10 Four centuries later, Soekarno used the Sultan’s claim to name the same territory ‘East Indonesia’, ignoring the fact that in 1679, the Dutch governor of Banda Island, Mr Keyts, wrote that the Sultan’s claims should not be taken seriously. Sokearno also ignored public statements by Captain Thomas Forrest in 1775, and the governor of Ternate in 1778, that the Sultan of Tidore had no power in West Papua and no claim over the territory.11 Soekarno also ignored the writings of Dr. Kamma, a Dutch priest and anthropologist who worked in West Papua in 1940’s. Kamma claimed that Kurabesi, hero of Biak and Numfoor warriors, married the Sultan of Tidore’s daughter—but that such a marriage could only have resulted from a successful invasion by Kurabesi of the Sultan’s territory. (Some Biak-Numfoor, like my mother, still have land in Tunuwo in Ternate-Tidore resulting from the marriage). 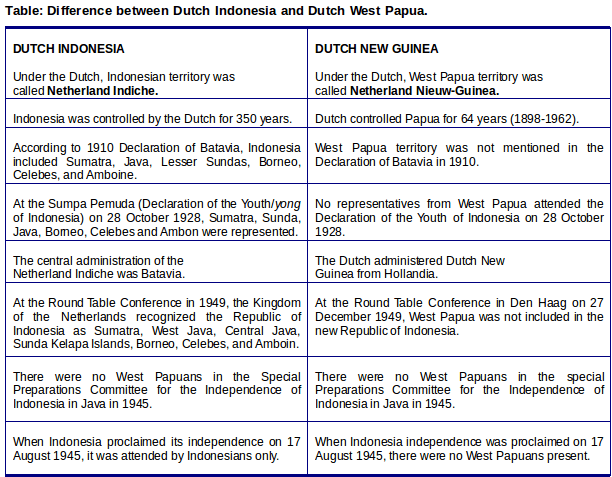 C. West Papua’s inclusion in the Unitary Republic of Indonesia because it was a colony of the Dutch East Indies. Firstly, the peoples of West Papua, and the rest of the Indonesian archipelago, were both colonised by the Dutch, but their colonial experiences were different. Secondly, if the Indonesian military government can claim former colonies of the Dutch Empire like West Papua, why didn’t it also claim other Dutch colonies like Surinam (in South America) Barbados (in Central America) and Guinea Bissau (Africa). D. The Indonesian military-government’s concerns about European neo-imperialism of West Papua. There are no indications that West Papua is being capitalized by imperialists in Europe, especially the Dutch; or that it has become headquarters for the Dutch to re-colonize Indonesia. The opposite in fact has occurred—with Indonesia behaving as a typical colonial power in West Papua, and destroying its province. The ideology of Soekarno’s Orde Lama (old order) was nationalism, religion, and communism (NASAKOM/Nasional, Agama, and Komunis). The sociopolitical order during the reign of Indonesia’s second president, General Haji Mohammad Soeharto, was called Orde Baru (new order) whose ideology was masked by PANCASILA (a doctrine of five basic principles: belief in one God; just and civilised humanity; unity of Indonesia; democracy guided by wisdom of representative deliberation; social justice for all Indonesians). IMPORTANT POINTS OF INTERNATIONAL LAW REGARDING THE NEW YORK AGREEMENT OF 15 AUGUST 1962. A. West Papuans were not consulted for the New York Agreement that arranged their status and their future, even though in the sixties there were many West Papuan intellectuals, ministers, priests, teachers, nurses, engineers, public servants, politicians, and architects. In fact, at the time, the literacy rate in Biak and Numfoor islands was higher than in Java. B. The United Nations should not have given authority to the Indonesian military government to administer West Papua, because the territory was still an internationally-recognized zone of conflict between the Dutch and the Indonesians. C. After the Dutch Government transferred the administration of West Papua to the United Nations Temporary Executive Authority (UNTEA) on 1 October 1962, UNTEA should have listed the territory as “non self-governing territory”, and should not have transferred it to the Indonesia military government eight months later. D. The Act of Free Choice referendum should have been held within the first year of the United Nations administration (that is, before 1 October 1963), not six years after the territory had been controlled by the Indonesian military government. E. The referendum in eight regencies should have taken one day, not nineteen (19) days between 14 July and 2 August 1969. F. If the majority of the people, using a one person-one vote system, had chosen to integrate with Indonesia, it would have been legal for Indonesia to take control of West Papua. But so far there has not been a referendum where each West Papuan has the right to vote. G. The Indonesian Constitution, Laws and Regulations should not have been used in West Papua between 1963 and 1969, because West Papua was still classified as a territory in conflict. The nation of Melanesia West Papua is trying to avoid conflict. We must respect each other. We must develop justice. We encourage peace between individuals, families, tribal groups, and nations. We must be responsible for looking after our environment, which is also the world’s environment. To ensure our role as a global citizen, West Papua has chosen truth and justice as the basis for the development of peaceful solutions. A. West Papua’s right to self-determination. Forty years ago, West Papuans were stripped of their dignity and their human rights. In the modern era, most of us agree to respect human dignity, democracy, the environment, and the law. All would agree it is best to solve West Papua’s problems by the application of democratic principles, not military force. This means recognizing West Papuans’ inalienable right to self-determination—which in practice means a referendum where people are given the right to choose between autonomy or independence. the best guarantee of a prosperous independent West Papua. 2. Indonesians, encouraging them to learn to understand democracy, and to respect the legal, political, social, cultural, economic, and security rights of the West Papuans. Indonesian government officials especially need to understand that there are serious discrepancies between the way they and the West Papuans view their shared history, and that there is validity and credibility to the Papuan perspective. 3. The International community, which after all through the United Nations is partially responsible for the current situation, has an important role. It must force the Indonesian government to understand that militarization if a problem not a solution. It must facilitate and mediate talks between leaders of West Papuan political parties and the Indonesian government to ensure that both sides uphold respect for human dignity, human rights, democracy and the law. Indonesia used Russian military support to invade Dutch New Guinea early in 1962. This exploited Cold War tension, which America, through the United Nations, resolved by arranging for the Indonesian Republic to take-over the administration of the disputed territory. Dutch cowardice, American and Russian arrogance, and United Nations neglect mean that all aspects of life in West Papua has been planned, organized, and controlled by the Indonesian military-government, including West Papua’s right to self-determination. During the dark and lonely years since 1963, Melanesia West Papua has had no sympathy or support from the international community. Their rights as a people have been sacrificed to Indonesian greed, and they have been forced to shoulder a problem they did not create. The wisest solution to the problem is also a peaceful one. 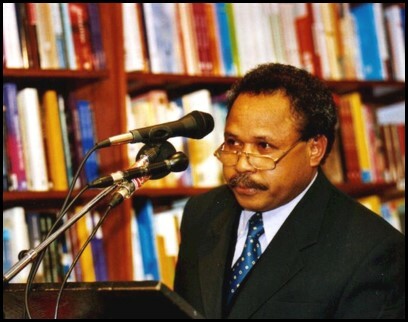 One which will also allow Melanesia West Papuan’s their inalienable right to self-determination. The young, more sophisticated generation of West Papuans, has not been indonesianised, but rather is inspired by our long, desperate fight for truth, justice and democracy. West Papua’s story is a rich, challenging drama about realpolitik, depravity, greed, cowardness, sacrifice, hope, faith and courage. It is a big story that we will continue to tell. 1969 Agenda item 98, Annexes, 24th session, New York Agreement between the Republic of Indonesia and the Kingdom of the Netherlands concerning West New Guinea (West Irian) : report of the Secretary-General regarding the act of self-determination, Original text : English, 15 August. 1969 Departemen Penerangan Republik Indonesia, PEPERA di Irian Barat. 1993 John RD. Djopari, Pemberontakan Organisasi Papua Merdeka, PT. Gramedia Widiasarana Indonesia, Jakarta. 1999 Kareth Ferry M., Perjalanan integrasi wilayah Irian Barat ke dalam negara kesatuan Republik Indonesia (Suatu Tinjauan dari Aspek Yuridis), Bandung. 1979 Lagerberg Kees, West Irian and Jakarta Imperialism, London, Hurst. 1998 Paul Sillitoe, An Introduction to the Anthropology of Melanesia-Culture & Traditon, Cambridge University. 1982 Ronald Laidlaw, Asian History, China, Japan, India, Indonesia, McMillan, Australia. 1977 V.G. Honour et al, The New Jacaranda Atlas, The Jacaranda Press. 1998 Isabella Tree, Island in the Clouds. Lonely Planet Publications.